Liverpool manager Jurgen Klopp admitted he may be forced into the transfer market after the club's injury problems worsened during their League Cup semi-final first-leg win at Stoke. Philippe Coutinho and Dejan Lovren went off with hamstring injuries and Kolo Toure ended the 1-0 victory with what appeared to be a similar problem. Klopp had previously said he would not buy new players in January. But after Tuesday's game he said: "This is something we have to think about." Liverpool have no fit central defenders as Lovren joined Martin Skrtel and Mamadou Sakho on the sidelines, while Toure was clearly struggling at full-time. Midfielder Lucas had filled in alongside the Ivorian at the Britannia Stadium after Lovren's first-half injury. "Two weeks ago we had three centre-backs, which is a good situation, and the season started with five - but now it is zero," Klopp added. "It is a strange feeling because on one side it is very, very good then we have these injuries." Youngsters Divock Origi and Jordan Rossiter have hamstring injuries, while England striker Daniel Sturridge has had a catalogue of problems. 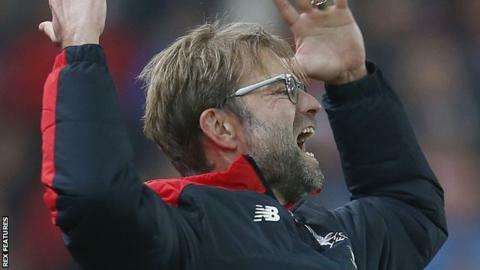 BBC Radio 5 live pundit Kevin Kilbane, who was at the Britannia Stadium, suggested Klopp's methods might be responsible. He said: "I've seen it at some clubs before. Perhaps it's down to the change in training methods. Under Jurgen Klopp they'll train much harder day in, day out. "The amount of medical attention footballers get at football clubs now - and also the physical work which is put in - this shouldn't be happening. I put down the various hamstring injuries down to Klopp's change in style." Klopp, though, pointed to the heavy demands made on Premier League players. "Maybe I could look at our training methods but we don't train - we only recover. There is no training," he said. "I'm responsible for these things and if you want to make me responsible for our hamstring strains, then OK."
Victory on Tuesday meant Klopp has taken a big stride towards a Wembley final after only three months at Anfield. However, impressive 3-1, 4-1 and 6-1 wins at Chelsea, Manchester City and Southampton respectively have been mixed with poor performances in defeats by Newcastle, Watford and West Ham. "If somebody had told us it would be 1-0 before the game we would have taken it but it is just 1-0 and nothing is decided in the first leg," Klopp added. "We showed what we were capable of, although we have shown what we were capable of in other games. We have to show more consistency."